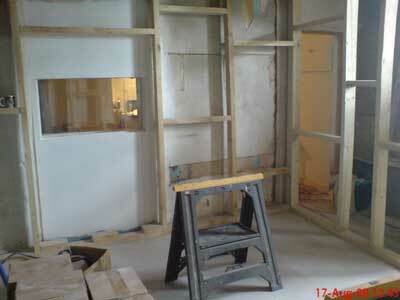 In these pictures, we see the construction of the frame taking shape. My colleague, Phill (in the white shirt), is the person responsible for making this construction happen. Originally I had various band members and musicians who offered to help out in exchange for studio time, but when Phill heard about the project, and having recently completed a course in plastering, he offered to do the job at a greatly reduced rate. His small cash fee will be subsidised by the equivalent hours in studio time vouchers that we will sell at half price, to bring him the extra cash after the job is finished. I had no proper plans for the construction on paper. Every last detail was all in my head. So Phill and I have worked closely together in getting the whole project completed. Many small problems have been ironed out along the way. I did all the material calculations and ordering, so everything was there for Phill to work with when necessary. 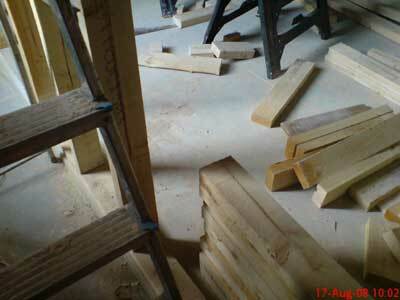 Apart from one length of timber that we have retained “just in case”, all the timber was used. 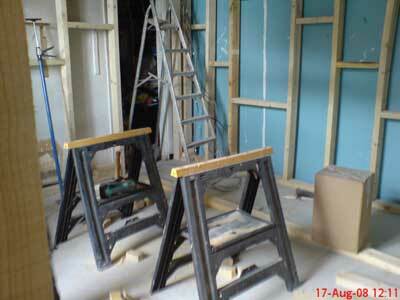 Any offcuts that were long enough have been used as horizontal supports. Most of the remaining shorter pieces that you see in the picture below, will be used in the construction of the studio furniture. 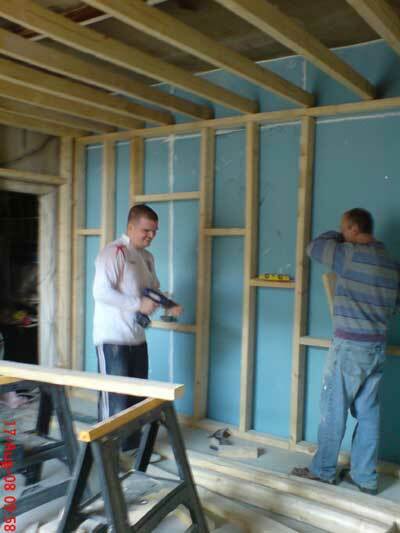 At the moment, the structure sways a lot and doesn’t seem very strong, but once all the plasterboard is attached, it will be as strong as any partition wall, even though it is not touching any part of the existing structure.